ACLIN & SELMA DELIVER ATHEISTS AND ACTION IN ORIGINAL NEW ADVENTURE! Justin Aclin (Star Wars: The Clone Wars, Twisted ToyFare Theatre) and Nicolas Daniel Selma (Tomb Raider: The Beginning) take aim at the supernatural in S.H.O.O.T. First, an all-new big-action, big-ideas creator-owned mini-series from Dark Horse Comics! The Secular Humanist Occult Obliteration Taskforce uses the power of their own disbelief (as filtered through sci-fi weaponry) to protect humanity from supernatural creatures that seek to do us harm…but for S.H.O.O.T., that means demons, angels and everything in between. Original, irreverent and sure-to-be controversial – S.H.O.O.T. First promises sci-fi action in the Dark Horse tradition, with a bold new twist. The brave young warrior Kani battles a gauntlet of fantastic mythical beasts inspired by Japanese folklore. However, things are not what they seem, and danger lurks where Kani least expects it! After being tricked by Yokai disguse as a human, Kani is sent to village that has been taking over by two Yokai who place her in a dream like trance, in this dreamlike state she is training to become a Red Hunter and meets up with two unknown Red Hunters who accompany her, At the same time in the real world red hunters Mitsuo and Fumiyo are looking for her since she hasn’t arrive at the village, as they track her they also encounter the yokai fox who mocks them. Back in Kani Dream state, Kani and the two other red hunters come across a few Yokai who get the best of Kani, Meanwhile Mitsuo and Fumiyo return to Kani Village in hopes of finding her there. They meet up with her father and ask him if he’s seen her, thinking the worst Kani’s father starts to panic. And begins to question the red hunters of Kani whereabouts as well. The fox appears again starts to mock Mistsuo and Fumiyo again, under the assumption the Yokai has taken her they capture him and ask him where he has hidden Kani. He tells them Kani is in a place that none of them can find her, he then asks if they have heard of the Demon king in Frostrock Mountain and the Ghost Werewolf Clan. Next we see a member of the Ghost clan Tanaka taking to the Demon king, he says that Kani will and heart is strong and that it will be difficult to complete the task he has given them. The Demon king tells him that killing Kani who hurt the Yokai’s plan of taking over, but if they were to corrupt her by taking something form her maybe then they could succeed. The issue ends with Kani waking up and confronting her captors, who turn out to be werewolves of the ghost clan, as they attack the unarmed Kani she is pushed to use a new ability that taps into the karma crystals. Akanerio was first introduce to us through a action role-playing game that was developed by American McGee’s Spicy Horse company, the game was base heavily on the Little Red Riding Hood tale but in feudal Japan also add a mixture of manga and Japanese folklore. Issue #1 is basically a origins issue, the main character Kani whose tribe the Ainiu’s live on the island of Yomi, they are a religious tribe that believe in spiritual guidance or direction so it seems, writer Aclin doesn’t really get into detail about them,Then there’s another tribe called the Akane’s they are a warrior tribe that defend the island form “Yokai” demons that also in habit Yomi island. The Akane’s have a elite group of specially trained warriors called the Red Hunters, who are the ones that defend the island. The two tribes have a history and are both trying to gain the upper hand on one another, The main character Kani whose mother was killed by a Yokai believes the Red Hunters are necessary and that the ways of her people are slow. During a spiritual ceremony a Yokai eludes one the Red hunters and attacks the Ainiu village, Kani who witness the death of her mother begins to attack the demon along with the Red hunter it escaped form. After the demon is killed the elder of the Ainiu’s blames the attack on the Akane’s and the Red Hunters, he declares war against them. But before things can get out of hand Kani suggest that maybe war could be eluded if she was to join the Red Hunters, the other elders agree that just maybe things could be better between the two if she would join the clan, but only if she can pass the test all Akane’s must take before becoming a red hunter. During her journey to the village of Akane Kani endures the harsh snowy mountains a group demon infected hares that attack her now injury and tired she comes as cross a man standing by two rhodes. After getting directions form the man she continues her journey little did she know is that the man was actually a Yokai disguise as a man and he just sent her in the wrong direction. 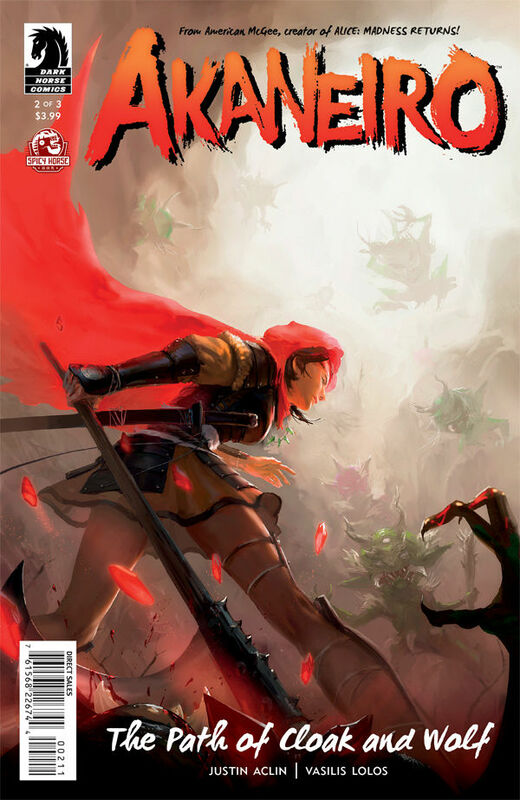 Final Thoughts: Akanerio #1 has very solid writing theirs a good amount of exposition throughout the issue, Justin Aclin blends both American and Japanese folklore together quite well the flow and pacing reminds me of a manga one that comes to mind is Inuyasha, if not for the artwork it could maybe pass off as a manga. Now when I say “if not for the artwork” I’m not saying its bad. Artist Vasilis Lolos does a beautiful job on the monster designs each have there own distinct features which is must when creating beasts who are mutated by demons. While the character designs are good the lack of backgrounds in some panels is unacceptable, Shu yan cover art is amazing if may say.All in all Akaneiro #1 is a good issue and worth following I’m for sure going to keep an eye out for it. 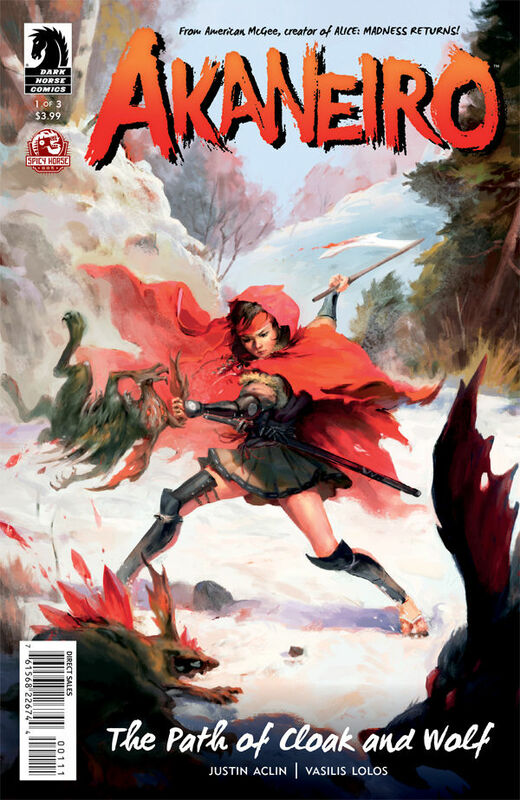 AMERICAN MCGEE’S SPICY HORSE STUDIOS TO BRING THE ARPG AKANEIRO TO COMICS! 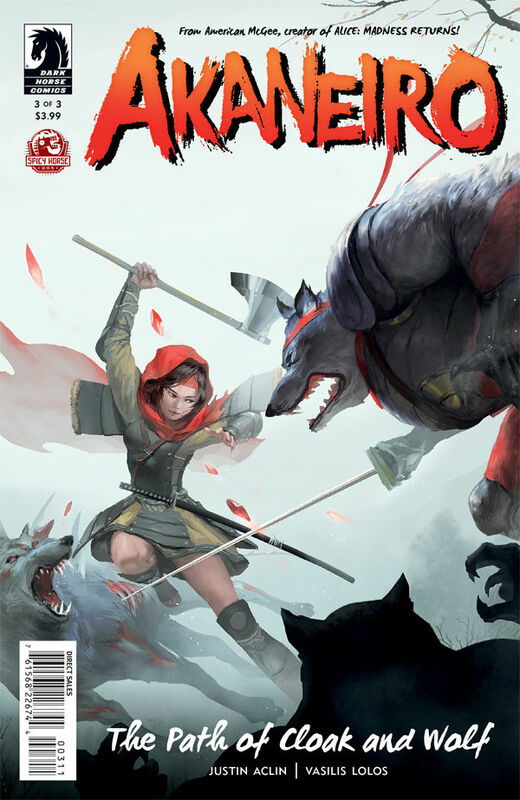 Following up on last week’s Kickstarter launch of Spicy Horse’s upcoming ARPG, Akaneiro: Demon Hunters, Spicy Horse Studios and Dark Horse Comics announce that this soon-to-be-released game will be expanding into comics! From the brilliant minds behind video game auteur American McGee’s Spicy Horse Studios, Akaneiro mixes a foundation of Japanese folklore with an original mythology inspired by Red Riding Hood, yielding a fantastic and exciting setting for players to explore and perfectly setting the stage for the visual storytelling of comics. 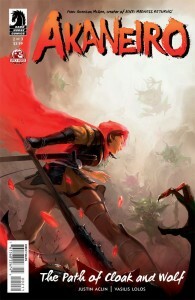 Written by Justin Aclin (Star Wars: The Clone Wars) and illustrated by Vasilis Lolos (Conan the Barbarian), the comics follow Kani¾a young woman torn between two cultures¾on an epic adventure hunting devious Yokai and pursuing a destiny far greater than even she can perceive as a member of the fabled Order of Akane. Known for his bold artistic vision and high-concept reimaginations of well-known characters, American McGee builds on the success of American McGee’s Alice, its sequel, Alice: Madness Returns, and the episodic game American McGee’s Grimm. 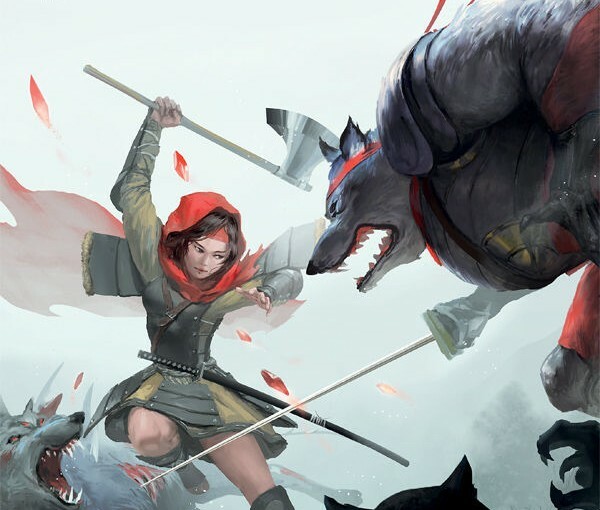 This reinterpretation of Red Riding Hood as a monster hunter in a mythological Japan is sure to excite fans and game critics alike. An original story expanding the universe of Akaneiro, featuring covers by the Spicy Horse artists creating the game, this three-issue comics series debuts on May 22!